* Some features depend on the script name in the 'giver sample'. Items which you want to give are set by just putting items into a giver. Items' permission is checked automatically. When the number of items which you want to give is one, the giver gives item as an 'object'. When the number of items is more than two, the giver gives items as an folder. The folder name will be same as the giver's name. When a giver script's name contains 'GroupOnly', the giver gives items to an avatar whose active group is the same as the giver's group. When a giver script's name contains 'GroupOnly' and 'Join', the giver invites an avatar to the group when the avatar's active group is different from the group or it is none. When a giver script's name does not contain 'GroupOnly', the giver gives items to all avatars. Copy 'giver-GroupOnly-Join' (script in the content tab) to your inventory. Prepare a box, and copy the script from your inventory to the box. Rename the script when you need to do. 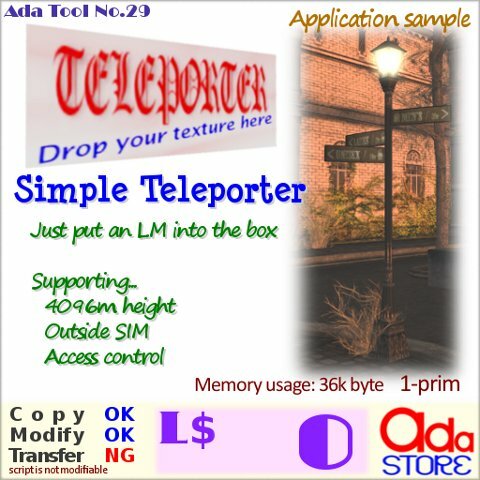 giver-GroupOnly gives items to avatars whose active group is the same as the box. giver-GroupOnly-Join same as the above. When an avatar's active group is different from the group or it is none, invitation will be shown. Set a group to the box when you give items to specific group members. Set the box name when the number of items is more than two. The name will be a folder name. Put items into the box. script in the box is modifiable. You can customize message and so on. This tool is a camera controller HUD for 'Machinima'. And it has some other functions that are related with 'Machinima'. Camera control: It can store camera positions, and it can move the camera position by complementing two of specified positions. Camera work sharing: It can reproduce your camera work on the other avatar's screen. Avatar movement: It can move avatar's position. It can also make you to fly high. Expression control: It can control express_* animations. Animation Override: It supports two kind of AO groups. Radar: It supports radar function for avatars or objects. Online check: It can check online status of specified avatars. CameraControllerV2: Main unit. Please use this as a HUD. 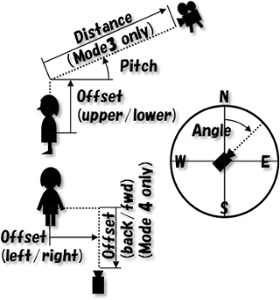 Camera control (1): When you want to move the camera to far, you need to change setting of your viewer. Check "Disable Camera Constraints" in "Advanced" menu. It is important when you share your camera work. Camera control (2): Whenever the tool is going to control camera, you need to press 'ESC' button before starting camera control by the tool. When your camera is not default status (after moving of the camera by ALT + mouse, for instance), press ESC button to release viewer's camera control. Otherwise, the camera won't move. Camera control (3): Whenever you want to camera control by a viewer, press 'camera cancel' button. Hiding HUD and menu: The tool will disappear before starting playback. If you have another HUD, I recommend to press 'ALT+Shift+H'. You can toggle HUD display. About the menu, you can toggle display by pressing 'ALT+CTRL+F1'. Playback time: Though you can specify playback time by the second, there is approximately 10% error. This is because of the implementation way. When error is getting bigger, the tool automatically adjusts it. Playback: During playback, you can do nothing. No interrupt can be done. Please wait finishing playback after pressing 'playback' button. In case of emergency, detach the tool. Command channel: The default is 3. You can change the channel number by editing configuration file (!CC2-config) in the content tab. Some buttons require input from the channel. "?" and "i" are for "Help" and "Information". These two buttons are on every tab. message height adjuster: You can adjust height of message position. taking away button: You can take the HUD away or restore it. Entry tab: You can 'Reset' script or can 'Reload' the configuration file in its content tab ('!CC2-config'). Recording tab (Point mode):It stores camera positions by clicking a record button. Recording tab (Auto mode):It stores camera positions by tracing your camera work. Playback tab:It plays back the camera work that stored by 'record tab'. Share tab:It receive another avatar's camera work. Camera control tab:It moves camera. Avatar contorol tab:It moves you. Expression tab:It controls facial expression. 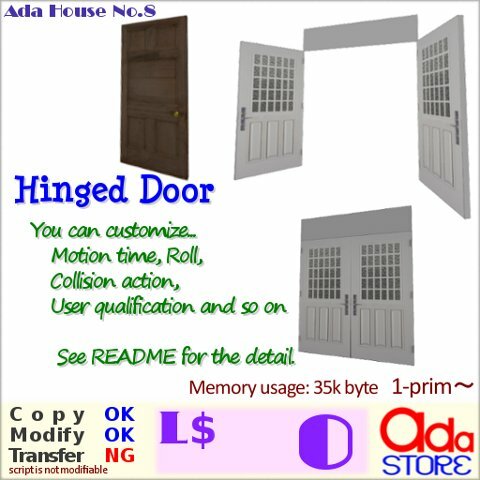 AO tab:It controls animation override. Radar tab:It senses avatar or objects around you. Online tab:It check online status of specified avatars. Some tabs continue to work when these are not active tab. In this case, a red marker appears on the button of tab. You can set animations for AO, UUIDs for online checker and channels for commands by editing '!CC2-config' in the content tab. After editing, click 'Reload' or 'Reset' button. This tab is for recording camera positions. The stored positions are played back by complementing two of positions. The playback time can be set by the second from a channel or a dialog. After recording, you can edit (replace, insert and delete) a camera position and you can set playback time. Select one of 'scene buttons'. Positions are stored to the scene number. Move your camera to the position, then click 'record button' to store it. Then move the camera to the next position, and click the button again. Continue to these actions until you satisfy. The movement time of point-to-point is the same. That is, when you move the camera slowly, you set points with short range. Click 'stop button', when you finish recording. After clicking the button, say playback time (the second) to the specified channel (the default is 3. You can change the channel by editing configuration file in its content tab). When you click 'stop button' more than 0.3 [sec], a dialog will be popped up for the playback time. When you click playback button before specifying the time, the tool uses the last playback time. You can insert/delete/replace the position. The position is selected by 'position select button'. Click playback button (long click for long countdown). You can check the camera work. The tool starts countdown from 3, and starts playback. On the same time, the tool disappears and animation of 'AnimSyncV2' starts. (see 'playback tab' section for the details of 'AnimSyncV2'). When the click time is more than 0.3 [sec] (long-click), countdown starts from 15. The difference of playback function between this tab and 'Playback tab' is 'multi-scene'. Though, this tab does not support 'multi-scene playback', the other functions are the same. It can start animation when 'playback' starts. See 'playback' section for the detail of animation synchronization. In order to use 'camera control by keyboard button', focus mode must be 'mode 1'. See 'Camera control tab' section for the details. The difference between this tab and Recording tab (Point mode) is the way of recording. After clicking 'auto recording button', the tool stores camera positions until cliking 'stop button'. Positions will be stored every 0.5 second (you can change the interval by 'time setting' button). The others are the same as 'Point mode'. See 'Point mode' section for the details. You can play back your recorded scenes and share the scenes with the other avatars by this tab. Click the scene button to select playback scenes. The order of clicking is important. You can see the order by color of selected buttons. Scenes are played back by the order of your clicking. The tool starts countdown from 3, and starts playback. On the same time, the tool disappears and animation of 'AnimSyncV2' starts. See later part for the details of 'AnimSyncV2'. if you can't satisfy the playback time, you can make playback time faster or slower by these buttons. You	can share your camera work by 'data sending button'. When you click this, the tool sends camera work data to the other avatars who is attaching 'CameraController V2', and selecting share tab. After sending data, click 'cue button for share button'. Then the camera work will be reproduced by your viewer and the other avatars' viewers. The tool will send command to 'AnimSyncV2' at top of each scene and end of playback. You can control animation by these command from the tool. This is a kind of pauseball that starts an animation by cue from the 'CameraControllerV2'. A script in its content tab is editable so that you can modify action. It must be on the same SIM as a sender. And it must be within 100m from a sender. Edit script in its contents tab. In order to reproduce another avatar's camera work, use this tab. This tab receives camera data from another avatar, and wait the avatar's cue. When the avatar click 'sharing playback' button, the camera work will be reproduced on your viewer. You need to stay on the same SIM as a sender. And you need be within 100m from a sender. Because of implementation specification, it is not guarantee 100% of data receiving. Lost data is replaced by nearest data. The camera will stop at these point during playback. This tab can move camera position and angle. There are four modes. * Depend on the camera position, focus might not be able to follow you sometimes. A mode can be selected by 'Focus mode button'. The button's color will be changed from light ocher(mode 1), pink(Mode 2), red(mode 3) to magenta(mode 4) by each click. When click time is more than 0.3 [sec] (long-click), the color changes to reverse. You can move the camera by 'Arrow buttons (1)' and 'Arrow buttons (2)'. Or you can use a keyboard instead of 'Arrow buttons (1)'. When you click 'Map button' when the mode is '1', Map will be shown, and you can teleport to the position. The velocity of the camera can be set by 'Speed button'. The button's color will be changed from green(very slow), yellow green(slow), yellow(normal), orange(fast) to red(very fast) by each click. When click time is more than 0.3 [sec] (long-click), the color changes to reverse. When 'Acceleration button' is active, velocity is getting faster. NO WARRANTY: When you click 'Speed setting button' more than 2 [sec] when 'Acceleration button' is not active, you can set the distance or the angle from the command channel. The distance or the angle is effective until changing of speed or acceleration. When you are moving the camera by this tab, the following information is displaying. You can move yourself by this tab. The moving velocity of the avatar can be set by 'Speed button'. The button's color will be changed from green(very slow), yellow green(slow), yellow(normal), orange(fast) to red(very fast) by each click. When click time is more than 0.3 [sec] (long-click), the color changes to reverse. When 'Acceleration button' is active, moving velocity is getting faster. There are two ways of controlling the avatar. One is by 'Arrow keys', the other is by a keyboard. Keyboard control will be active by clicking of 'Keyboard control button' (Simultaneously, 'Flying-high button' will be active). When you click 'Flying-high button' when 'Keyboard control button' is not active, only flying height can be controlled by the keyboard. Moving velocity is different from the keyboard and the arrow buttons. By keyboard control, you can not move slowly and you can not be speeding up on the ground. When you activate 'Keyboard' or 'Flying-high', these controls continue to work even if you change the tab. You can see the indicator below the tab. 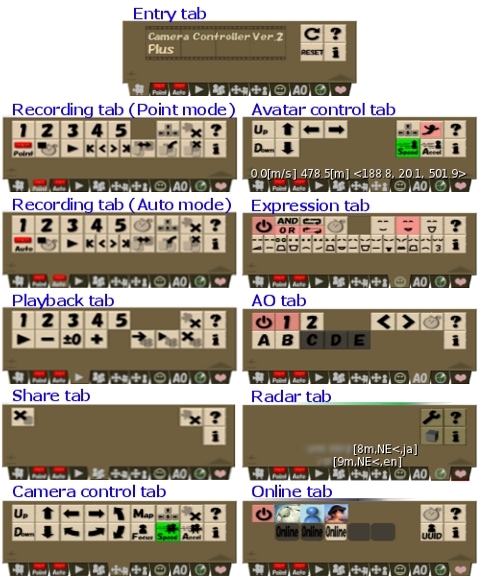 Keyboard control for the camera on 'Recording tab' or 'Moving camera tab' has higher priority than avatar control. NO WARRANTY: When you click 'Speed setting button' more than 2 [sec] when 'Acceleration button' is not active, you can set the impulse from the command channel. The impulse is effective until changing of speed or acceleration. 100 is big enough to go through a thin object. When you are selecting this tab, the following information is displaying. See http://wiki.secondlife.com/wiki/Control for the details of keyboard assignment. If you attach another 'flight-assistant tool', you will have a trouble. This tab can control your facial expression. Expression can be controlled by interval, pause, play type and loop mode. continuous interval Expression will be changed to one of selected expressions at every 'interval' second. play & pause interval - pause It is the same as the above, but there are pause period that is not playing of expression animations. continuous infinity All of selected expressions are played simultaneously. From the upper left button, buttons mean 'smile', 'toothsmile' and 'laugh emote'. From the lower left button, buttons mean 'disdain', 'bored emote', 'surprise emote', 'open mouse', 'shrug emote', 'wink emote', 'cry emote', 'embarrassed emote', 'sad emote', 'anger emote', 'frown', 'tongue out', 'repulsed emote', 'afraid emote', 'worry emote' & 'kiss'. This tab controls animation override(AO). You need to prepare animations before using this function, though sample animations are pre-defined. Animations must be in the content tab of the tool. And you need to enter animation names in the configuration file (!CC2-config). Two AO sets are switchable, when you set animations to "ao1_*" and "ao2_*". you can change AO group by clicking on a 'AO group button'. When the number of animation for a status is more than two, you can change animation by clicking 'previous animation button' or 'next animation button'. Otherwise, animation is changed at every 'interval' seconds. 'Interval' can be changed by 'interval button'. When you specify animations to "quick_animation" in the configuration file, you can use 'quick animation buttons'. One of the specified animation is played by the button. This tab scans avatars or objects. You can change targets by clicking of 'setup button'. When targets are objects, you can specify the name of targeted objects. After clicking 'object name button', say the name to the command channel. You can use '*' as a kind of wild-card. When you want to use forward matching, set the name as "foobar*", for instance. "foobar", "foobarabc", foobar123" and etc. will match the specified name. "*foobar" is an example of backward matching. "*foobar*" is an example of partial matching. "*" matches every object. The top of the tool indicates scaning speed. 'sensor' is called at the same time of animation run. The radar shows avatar names or object names (exception: target is an object and 'complete matching' rule is selected). And it shows additional information, such as distance, coordinates, direction or viewer's language. 'direction' contains symbol of point of the compass (N,NW,W,SW,S,SE,E,NE) and relative location (<,>,f,r,U,L). '<', '>', 'f' & 'r' mean 'left', 'right', 'front' & 'rear' respectively. 'U' and 'L' mean 'upper' and 'lower'. 'U' and 'L' appear when the height difference is 10m or more. See 'CAUTION' for the detail of command channel. The top of the tool indicates check interval. Online status is checked at starting of scan animation. UUID can be obtained by 'UUID button'. After clicking the button, say avatar name to the command channel. Then the tool try to get UUID from w-hat.com. If the UUID of the avatar could not get from the web, the tool uses 'sensor'. In order to get UUID by 'sensor', target avatar must be around you.